The World cup 2010 scoresheet was one of the best ways to stay on top of the World Cup 2010 schedule. This World Cup featured 32 teams from the start and it is not easy to see how each team is doing in the grand picture. After all, when the group games are played the teams all go into the knockout rounds. Download this easy World Cup 2012 scoresheet for Excel. In order to see what your team could come up against in the knockout stages, you use the World cup 2010 scoresheet. The World Cup 2010 schedule was determined a few months before the tournament. From there, you could see just what your team had to do in order to progress. You predict the team’s results on the World cup 2010 scoresheet and you can see how they will go on in the latter stages. In addition to predictions, this World cup 2010 scoresheet is great for keeping up with the tournament. As the World Cup 2010 schedule rumbled on, you simply add the results to your World cup 2010 scoresheet and you will be able to see what is going to happen. This was a great piece of excel software! 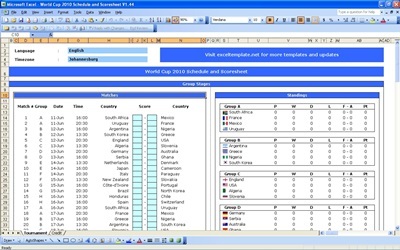 The World Cup 2010 schedule software will be great for 2014 as well. This is a tournament that is going to have the same number of teams! You will be able to make predictions once you know who is going to be in which group. You will also be able to keep up with any world cup this way. The World Cup 2010 schedule was a tough and complicated one, but this scoresheet made it all easier. So be sure to check out the scoresheet and you will see how much it will help in terms of keeping up with a tournament. Who knows, you might even be able to predict who will make the final based on permutations you get from your scoresheet.